Presented in conjunction with WASTE LAND: A Survey of Works by Brandon Ballengée, 1996-2106, Audubon & Van Hoesen: Illustrating Animals presents a selection from the Art Museum’s permanent collection. Animal illustrator artists John James Audubon (American, 1785-1851), John Woodhouse Audubon (American, 1812-1862) and Beth Van Hosen (American, 1926-2010) depicted animal subjects with scientific devotion, emphasizing the importance of craftsmanship and technique in the creation of their artwork. John James Audubon was a renowned ornithologist, naturalist, and wildlife artist. He extensively studied and documented all types of American birds in his major work entitled The Birds of America (1827-1839) that detailed birds in their natural habitat, through which he identified 25 new species. Because of the difficulty of safely studying wild animals and seeking to illustrate accurate representations of the animals he would observe them in cages or kill them with a clean shot and use wires to prop them into a natural position, usually as if caught in motion. Through meticulous and concentrated examination of the specimen and extensive field notes, he created illustrations that were scientifically accurate as well as artistically successful. Audubon is universally recognized by art and natural history museums. 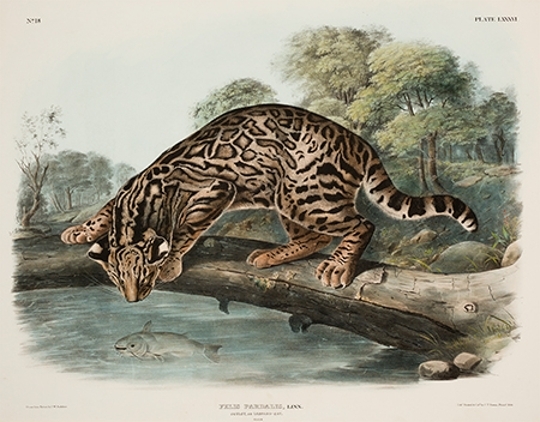 John Woodhouse Audubon continued his father’s work and assisted with the completion of several of the bird and mammal portfolios working side-by-side with his father. Although is career is often tied to that of his father, his contribution to early wildlife documentation is significant. Working almost 150 years later, Van Hoesen’s attention to accuracy in her depictions of birds and animals, is comparable to the Audubons. However, unlike John James and John Woodhouse Audubon, her approach was less scientific. She drew from live subjects, always searching for the animal’s individual, specific personality in order to convey the “look” of life in her subjects. 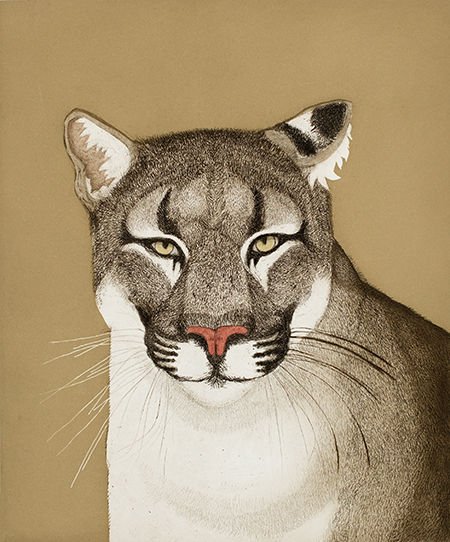 Working with live animals, Van Hoesen developed techniques from her years of habitual drawing to work quickly to capture a specific pose. By focusing purely on the animal, Van Hoesen places her subjects in isolation, stripping them of any outside context. The viewer is forced to look at the subject, only the subject, and it becomes obvious that they have been carefully observed and rendered technically correct. These artists demonstrate that the art of illustrating animals, in both artistic and scientific perfection, are intrinsically connected and are not spontaneous but born from keen observation and repetition.